We stood on the deck, staring at the back door, blank looks on our faces. Mildred, who jiggled and joggled the lock to no avail, was creating a lot of unnecessary noise. Shaking my head at her, I snapped my fingers but she ignored me. Then Cory motioned to me to show me he had found what appeared to be a small door. 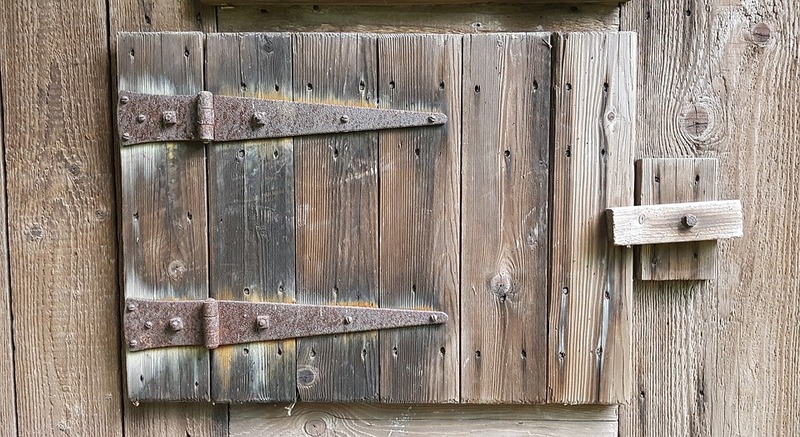 I looked down and saw this wooden door with a latch, which actually reminded me of the doors they had on “Laugh In’. I couldn’t help wonder if there was enough space behind it to fit a person. Maybe Goldie was back there. Or maybe…oh right, I’m wandering. So sorry. Getting back on track, I nudged Mildred, again, to get her attention, and to stop her from making such a racket. This time she stopped. Cory jumped off the deck and made his way below to investigate the door. Signaling up to us, we all climbed down to find out exactly what he had discovered. There was no lock, just a small latch that turned easily downward, allowing one to open the door. The hinges creaked, eerily sounding like a spirit being awakened from its tomb. I stooped down, and fully opened the door. It was pitch black. I couldn’t see anything in front of me. I asked for a lighter, but since no one smoked, no one had one. Great group I have here. Always at the ready. Pfft. Clicking my walkie, I asked Fred if he had matches or a lighter. There was no response. I radioed again, still no answer. I had no doubt, he had fallen asleep. We had no way of knowing if ~M was still at her writing desk. Deciding I needed to take care of this personally, I told Cory and Mildred to stay where they were, and for God’s sake, be quiet!! I headed back to where we had left Fred, by the big oak tree, where I found him sound asleep next to it. I jostled him, finally waking him up and pointed upward to show him ~M was nowhere in sight. The house was dark and shades had been drawn. He said nothing but hung his head down, knowing he had really screwed up. We both headed back to the others, only to find Cory missing. Mildred was standing there with that “I told him not to do it” look on her face. Cory had gone through the door. It seems he found a stash of matches inside a fake rock, which was right next to the door. At least he had enough sense to not go in blindly. I called to him, but only created an echo of my own voice. I waited. Nothing. Then Cory called back, in a whisper as to not deafen himself that it was safe to come in. Come in? Where, exactly, were we going in to? I sent Fred first. He struggled to get his large frame through the entrance but eventually made it. I could hear a low “Wow” through the opening. Mildred went next, I brought up the rear and closed the small door behind me. We were standing on cobblestones that lined a long metal tunnel. Cory was holding a match that dimly lit the way. I prayed he had taken more than one with him. Unsure of where we were headed, we began our journey into the tunnel, with only the sound of our breathing, echoing off the walls. Be carreful! You are entering M’s Fun House!